Milton, Ontario - On Wednesday, Septebmer 21, the feast of the Nativity of the Most Holy Theotokos, His Holiness Serbian Patriarch Irinej officiated at the Divine Liturgy at Holy Transfiguration Monastery in Milton with the concelebration of Their Graces Vasilije of Srem, Hrizostom of Zvornik-Tuzla and Mitrophan of Canada as well as V. Rev. Stavrophor Vasilije Tomic, V. Rev. Stavrophor Mihailo Doder, V. Rev. Stavrophor Prvoslav Puric, V. Rev. Stavrophor Dragomir Ninkovic, V. Rev. 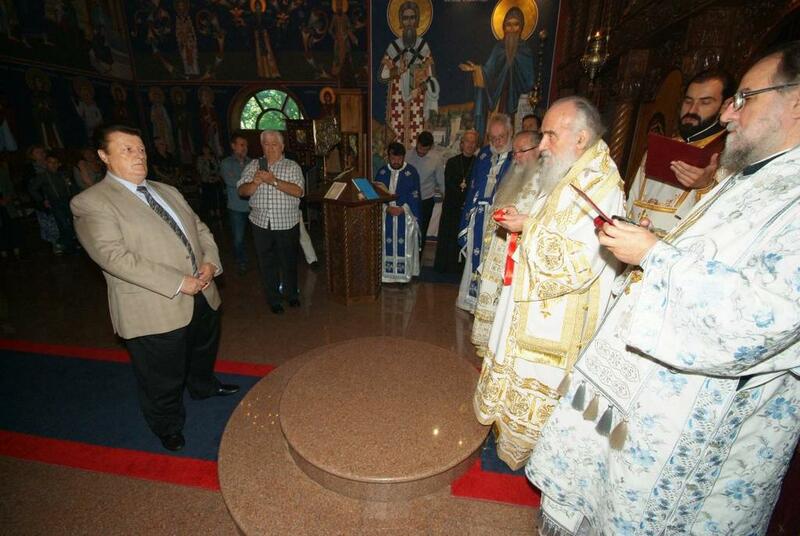 Stavrophor Milojko Dimitric, Protosindjel Vasilije (Gavrilovic), Protodeacon Damjan Bozic and Deacon Djuradj Kojic. 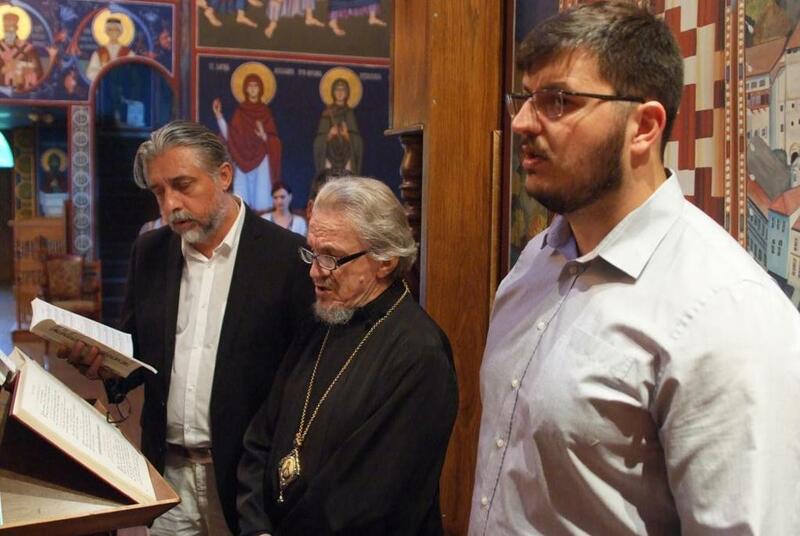 On this occasion, Milan Lesic, for his great service to the Serbian Patriarchate, a great benefactor and bearer of the Order of St. Sava was given the Order of King by Milutin by the Holy Assembly of Bishops and upon the recommendation of His Holiness the Serbian Patriarch. His Holiness, while delivering the award to Mr. Lesic, thanked him for all his good works which he did for his Serbian people, particularly during the wars in the 90s, but he also called upon him that this recognition by the Church stimulate him to sacrifice himself more for the glory of God. Milan Lesic was born April 24, 1939 in Osredak, near Bihac. He moved to Canada in 1959 where he entered into holy matrimony withSmilja, nee Stojanovic. They have two sons, Mile (35) and Pero (33). He studied Business Managment Human Resources at Western University in London. He works in real estate and investments. "Your Holiness, Your Graces, honorable fathers, dear brothers and sisters. It is my great honor to have the Holy Synod of Bishops, upon your recommendation Your Holiness, award me with this recognition of our Holy Church, the Order of the Holy King Milutin, a great benefactor. I thank you, Your Holiness, for your beautiful words which oblige me to follow the path of Christ with more commitment and firmness in faith. When I look back and reflect on my life's path I can say nothing but give thanks to the Lord God. I thank Him for always being with me and always helping me. And now I can say that everything I did and attained, as weak and feeble as I am, I did it all through God's help. As I child I heard the words of Christ that we should not get tired of doing good deeds and many years later the words of a thinker that the person who has much property is not rich, but rich is the man whom God has allowed to help others. I have tried to fulfill these words of Christ and the words of the wise man and for this reason I am immeasurably grateful to God if I have successed in doing this in the least. I thank our Holy Church which has always brought us together in this foreign land under its warm wings and as a good Mother has always watched over us. I thank my family, my wife Smilja, my sons Mile and Petar, who help me and support me and follow me on Christ's path, the path of love, forgiveness, charity, justice and truth. This is a great moment in my life and the life of my family for this Order - through me - has been given to them as well. I thank you all and, Your Holiness, I ask for your blessings."